PT Pertamina Internasional Eksplorasi dan Produksi - PIEP or known as Pertamina International EP is a reputable oil and gas company in Indonesia with international work area. Pertamina International EP is a member of state-owned oil giant PT Pertamina (Persero). According to PIEP's company profile as cited by JobsCDC.com, PT Pertamina Internasional Eksplorasi dan Produksi was formed on 18 November 2013 based on the need for an international asset management that is focused on the management of the overseas assets of PT Pertamina (Persero). 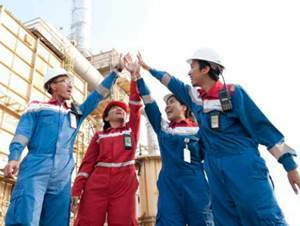 Based in Jakarta, PIEP now has 3 overseas assets; Asset Algeria (PT Pertamina Algeria), Asset Malaysia (PT Pertamina Malaysia Eksplorasi Produksi) and Asset Iraq (PT Pertamina Irak Eksplorasi Produksi). Bachelor Degree (or equivalent) in Engineering. Previous experience with cycle time reduction programs is a plus. Able to work with and supervise a multinational work force. Must demonstrate high performance in HSE and be HSE conscious. Previous experience in working with safety management system like permit to work, etc. Operating knowledge of Microsoft Office suite of programs. Knowledge of basic field operations, including separation equipment, water-handling facilities, flow lines, well testing, data gathering. Work location : Menzel Lejmat North (MLN), Algeria. Minimum Bachelor degree (S1) from various majors, preferably from Accounting/Financial Management. Minimum 9 years of experience for Bachelor degree (S1) or minimum 6 years of experience for Master degree (S2). Previous experience in the field of Finance in oil & gas industry, preferably in the field of Tax Management. JobsCDC.com now available on android device. Download now on Google Play here. Please be aware of recruitment fraud. The entire stage of this selection process is free of charge. Pertamina International EP - Supervisor, Analyst Pertamina Group October 2017 will never ask for fees or upfront payments for any purposes during the recruitment process such as transportation and accommodation.